Historically, gout was referred as “the king of diseases and the disease of kings” or “rich man’s disease” and its’ first documentation goes back all the way to 2600 BC Egypt. Why? It’s obvious that royalty and the rich could afford meats, alcohol and liked to fatten themselves up with other rich foods, as for the lower class they were stuck with a carbohydrate diet, whatever fruits and vegetables they raised on their land, rarely eating any meat but living a healthier life! Several hundred years ago gout was also thought to be caused by drops of viscous humors that seeped from blood into the joints. The word Gout is derived from Latin word gutta meaning “a drop of liquid” and has the unique distinction of being one of the most frequently recorded medical illnesses throughout history. What causes gout is excess uric acid in the body and is one of the most painful form of arthritis. It’s a complex disorder that is more prevalent among men, and afflicts women more commonly after menopause. Besides men have higher uric acid levels in their blood than women, that’s why nearly 6% of men have it and 2% of women in the US. That’s about 8 million Americans that have gout! Gout is a kind of arthritis caused by a buildup of uric acid crystals in the joints. Uric acid has no useful function in the human body; it is simply a breakdown product of purines, a group of chemicals present in all body tissues and many foods. Uric acid is a breakdown product of purines that are part of many foods we eat mostly found in meats, seafood etc… An abnormality in handling uric acid and crystallization of these compounds in joints can cause attacks of painful arthritis, kidney stones, and blockage of the kidney filtering tubules with uric acid crystals and can lead to eventual kidney failure. Most of the time uric acid dissolves and goes into the urine via the kidneys. However, if the body is producing too much uric acid, or if the kidneys are not excreting enough uric acid, it builds up. The accumulation results in sharp urate crystals which look like needles. (1) They accumulate in the joints or surrounding tissue and cause pain, inflammation and swelling. They accumulate in the joints or surrounding tissue and cause pain, inflammation and swelling. It’s usually characterized by recurrent attacks of acute inflammatory arthritis—a red, tender, hot, swollen joint (God knows I’ve had many) and the most commonly affected area is the big toe 50% of the time and is called podagra. Other joints that can be affected include the ankles, knees, wrists, fingers, heels and elbows and it is wise to always rest the joint that hurts as much as possible. In some people, the acute pain is so intense that even a bed sheet on the toe causes severe pain. I’ve personally have had sleepless nights of tossing and turning, trying to numb the pain with a bag of ice. 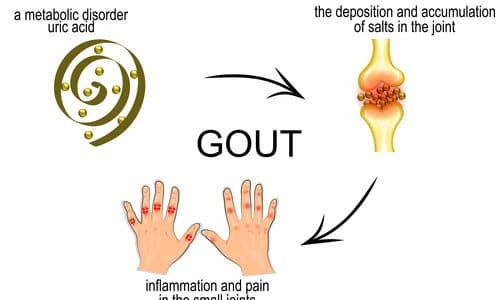 Usually, the gout attacks occur in the middle of the night, supposedly the coolness and temperature drop facilitates the crystallization of the uric acid in the joint. Digging deeper, high levels of uric acid in the blood called Hyperuricemia is the underlying cause of gout. Surprisingly, hyperuricemia is commonly found in many people who never develop gout. Scientists are not completely sure what causes hyperuricemia. There is definitely a genetic factor because a person who has close relatives with hyperuricemia is more likely to develop it himself. To confirm a diagnosis of gout, your doctor may draw a sample of fluid from an inflamed joint to look for crystals associated with gout or do a blood test to measure the amount of uric acid in the blood. Finally, you are more likely to have gout if you are a male, obese, is in your family genes, drink excessive alcohol, eat foods high in purines, regular aspirin, niacin or diuretics use, hypertension, lead poisoning, surgery etc… Complications can also arise from gout like recurrent gout, advanced gout in which urate crystals may form under the skin in nodules otherwise know as tophi, kidney stones may cause urate crystals to accumulate in the urinary tract, gout may also spread to other joints and obviously cause damage to the joints. Thank you for your ebook on gout and you. I started feeling pains in my knees about 2 years ago. I am currently 59 years old, female, married but without children. I was teaching in our local college then and my class is in the 5th floor. There were times the elevator (many times actually) when the elevator won’t work so I am forced to walk up the stairs slowly to my room. After some days and the elevator still not working, I had to request our Dean if my classroom can be transferred to the 1st floor because going up the stairs is really terrible. It was the 1st time I experienced that. I am on the heavy side for my height of 5″2″. I went to see a doctor who asked me to get a blood test for uric acid. And lo and behold my uric acid level was something like 365 and the standard using their reference was only 150. The doctor asked me to take Colchicine (uric acid med) but only for a month and I am to return to his clinic. If by that time, the pain is still there, he said he will extract the water from my knees. Fortunately, when the 30 days ended and I went to see him, the uric acid has normalized. However, last year, I was admitted in the hospital for a rare blood condition called Thrombotic Thrombocytopenic Purpura. I was admitted for 3 weeks, stayed in ICU for 2 weeks while I underwent plasma pherisis or plasma transfer. In the process, I had all in all 36 bags of blood plasma transfused in my system in order to regain the normal level of my CBC and LDH to normalize. Something like “mutiny” according to the doctor happened to me when my own antibodies fed on my red blood cells thinking they were enemies. Oh my had a lot of test but thank God all turned negative. The good doctor wanted to find out why such a disorder happened to me. After admission, I was still on reverse isolation for another 2 months but just at home. I was asked to continue taking steroids. Although every 2 weeks the dosage was decreased until by the end of October 2018, it was stopped. After a week from stop of steroids, I experienced pain from my shoulders down to my foot. I could not explain it. I told my doctor about it and she advised that I include uric acid in my next blood chem. And there again, my uric acid was high but not as high as before. If it was double 2 years ago, this time, it was only a 100 plus but nonetheless the shots of pains are there. I was prescribed with Febuxostat and my doctor gave me a guide on food sources that are low, medium and high in purine content so I can avoid or decrease those high in my diet. I also started walking before Christmas but now have stopped again because I have difficulty getting up early in the morning since its cold. But after reading the exercise portion of your ebook, I resolve to walk again and really be serious about it. I hope I have not bored you with my story. Again, many thanks. I have 3 brothers who’ve had gout for many years . I just started having gout flareups now….I’m a lady 66yrs old. My question is I have alcohol showing up on blood tests…but I do not drink….never have….alcohol put me to sleep….didn’t like it. I have other probs….the ususal metabolic syndrome things….high blood pressure, high cholesterol , Diabetes 2. I’ve lost some weight…very slowly. – I take L-Carnitine, Magnesium and coQ10, But I worry about my liver and kidneys…with alchohol in my blood. Please let me know what you think I should do. Also, do you think it’s good to try celery seed extract? I heard it is good for gout…but Whole Foods by me stopped selling it…not sure why?? Yes celery seeds helps you to urinate more frequently thus flushing out more uric acid. You can try NutriGout which celery seed is a key ingredient in the formulation. First I want to say thanks so much for your website, I have been Googling like crazy trying to heal myself and your site is so full of info. I am in good health. About 4 weeks ago the top of my right foot started aching out of nowhere. It got quite swollen. There was very little redness. I iced it a few times and took ibuprofin and nothing helped – so I went to the doctor. I assumed it was a stress fracture from working all day wearing non-supportive flat sandals.The doctor suggested to me that it may be gout. The doctor also sent me for a foot x ray (showed nothing) and blood test (uric acid levels came back normal). I am 4 weeks into dealing with this. I have adjusted my diet according to gout guidelines, even though Im not sure I have it. I do drink a couple glasses of wine a week, but not excessive drinking. I don’t drink soda at all. My question is, if this is gout, would it normally go on for 4 or more weeks straight? The pain is not excrutiating at all, but it is sore when I put full weight on it. In the beginning I was limping when walking as the foot hurt to put any weight on it. Now I can put some limited weight on it, and it’s only slightly swollen, so I’d like to think it’s getting better. It still swells up a bit daily, so I can’t wear most of my regular shoes. I stopped taking Naproxen because it killed my stomach. The doctor did not prescribe me any gout meds. Apparently, if it’s a stress fracture it can take 10-12 weeks to heal? Do you think this is gout? My big toe was never an issue in this foot problem. Toe was never sore or red – it was just the top of my foot. I am so stressed out about this and all these adjustments and I don’t even know if it’s gout. I have ordered some tart cherry pills now and I am going to try a few of your remedies and see if there is any difference. I just wondered if this sounds like gout to you? It’s a tough call but if I was a betting man, I’d bet you don’t have gout but you just aggravated your foot somehow maybe jogging, hiking..usually you should feel the inflammation on your big toe mostly, if you feel it around your foot, most likely it is not gout but heck what do I know, I ain’t a doctor. Especially since you say that you did your blood test and it did not show excess uric acid in the blood. Yes it is rarer for women to develop gout before menopause. I hope I’m right and it’s not gout. Wish you a speedy recovery! Thanks for the quick response. I hope you’re right, too! I guess I will just keep waiting it out and see if it gets better.